Social media has gone from a novelty to a must-have component in any business’ online marketing plan. However, using social media platforms effectively is easier said than done. 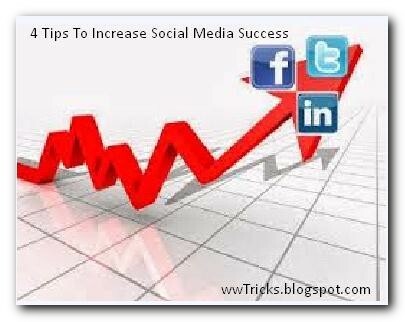 Most business owners struggle here because they really don’t understand how each social media platform works, what their friends and followers want, and how to leverage various platforms to create engagement and, ultimately, success.But below are Some tips for your social media success These simple tips will help you make the most of your marketing efforts. A quick look at the online world will reveal tons of different social networks, each with its own claim to fame. It’s important that business owners understand that each network is inherently different. What works on one may not work on another. That doesn't apply in some instances, of course. For example, G+ and Facebook are so similar that the same tactics will work on both. However, compare Twitter and Pinterest and you see two very different platforms. Tailor your content to fit the platform you’re using. If you’re involved with Pinterest, you need visual content. If you’re on Twitter, short tweets and links out to your site work well (especially if you’ve chosen the right option from the WordPress templates available and configured your plugins correctly). Consumers are free to post whatever takes their fancy when using social networks. It’s their prerogative. After all, they’re not trying to build their audience or drive sales. They’re just having fun. You can’t afford to take that tack. If you publish low-quality content (or the forbidden duplicate content), your followers will notice, and they won’t be happy about it. Keep your content premium, relevant and interesting. If you don’t have something that fits these criteria, don’t post. It’s as simple as that. On the same note, you need to understand the language used on each social network. You would phrase things differently for a Tumblr audience as opposed to your Facebook fans. The same thing applies to G+ and Twitter. Know the lingo and create content within its bounds for each social network, while keeping the need for high quality content foremost in your mind. The Internet has drawn many comparisons to the Wild West. It’s a pretty apt description. Things come and go quickly here, and there are generally no “hard and fast” rules to follow (other than the “always follow Google’s lead” rule). Don’t be afraid to experiment and try new things. Part of what makes social media marketing so difficult is that what works for one company won’t work at all for another. While you can draw inspiration from the efforts of others, don’t be afraid to do your own thing. This can actually lead to some seriously positive results. Think outside the box. Forget there even is a box. The days when businesses could obscure their marketing efforts are dying out (and mostly gone completely). In order to foster trust and acceptance with your target audience, you need to be transparent. Don’t use misleading ads or wording in your social media posts. If you’re promoting one of your products, come out and say so. If you’re running a contest that requires users to purchase something to enter, say so. Be upfront and transparent, and you’ll find that you alienate fewer people. While the tips above won’t make you a social media marketing master, they will help ensure that you’re able to get better traction and see greater success (ROI) from your efforts. Every little bit helps, and doing things the right way is definitely an important start. Comments are highly Appreciated Related to post! Thanks victor ameh for dropping your comment here. keep visiting and commenting. And I'm sure you'll see success in field of social media implementing these. its like a great post on how to increase your SMO. i am truly going to implement these for myself!!! these are the great points to increase media success.